This autumn in Oslo's Folketeateret, Scenekvelder has put together a memorable production of Les Misérables. 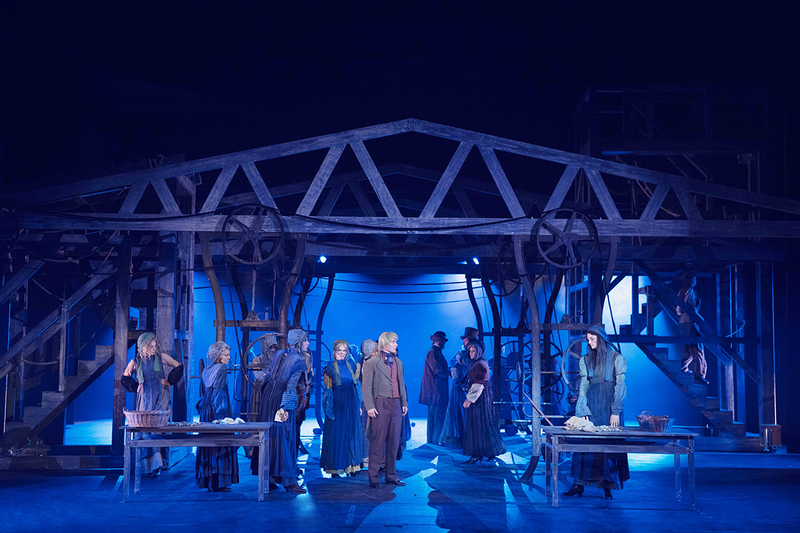 At surface, it seems like a well-made if not very imaginative production of good ol' Les Mis: the music sounds good and all the leading actors have beautiful voices, there are big emotions and lots of people onstage, the sets are grand and the costumes suitably ragged. Under the surface, it's actually the oddest and most unfocused production of Les Mis I've ever seen. 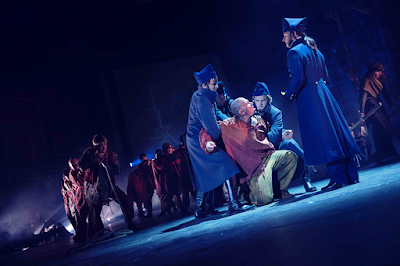 The new Norwegian production of Les Mis is directed by Per-Olav Sørensen. According to his bio in the souvenir programme, he has directed plenty of theatre, films and TV. No mention of any further stage musicals, though, and maybe it's no wonder – seeing this show, it feels like mega musicals might not be his best genre. First of all, the pacing of this production is strikingly slow. The music is in a way slower tempo than we're used to in contemporary productions of Les Mis. Everyone also takes their sweet time getting from place A to place B. For example, you know how Enjolras usually rushes onstage in One Day More, giving an energetic, dynamic impression? Here, he calmly walks to take his place downstage. There are many scenes where the pace is similarly sluggish, though the music and lyrics suggest fast action. Considering that, it's odd how all the way through, the direction is really, really afraid of giving anyone any quiet time alone. 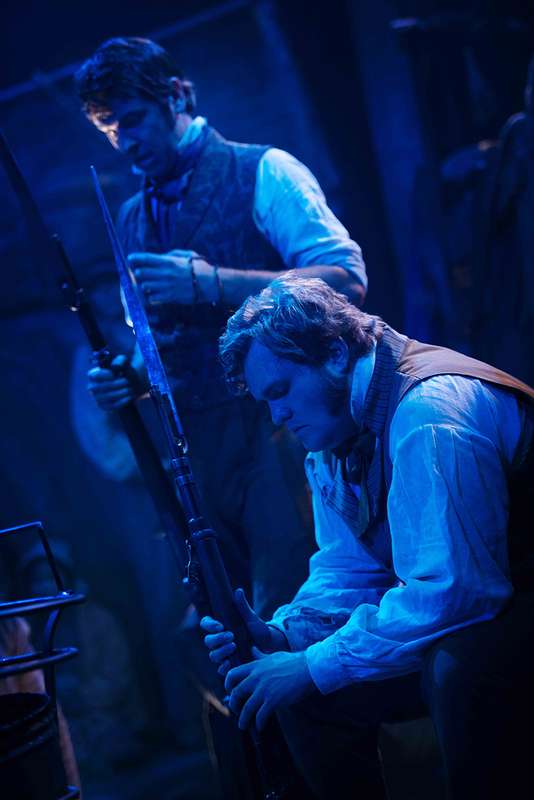 There's some unnecessary action going on during every other iconic solo of the show: Fantine changes into her prostitute costume in the middle of I Dreamed a Dream, Valjean gathers up firearms while singing Bring Him Home... It's as if the production doesn't really trust the source material, thinking people will get bored unless multiple things happen simultaneously all the time. The production has a huge ensemble and they're onstage a lot. Sometimes they simply hang out in the background while someone else sings a solo or a duet. That's really odd. It feels like they're breaking some unwritten rule of musical theatre. Usually, if there are others onstage during a solo, they're either a) listening to what the character has to say, like the Argentinians in Don't Cry for Me, Argentina from Evita, b) are meant to signify something, like when Les Amis appear during Empty Chairs at Empty Tables as a visual representation of Marius's memories, or c) are backup dancers. But when you have, say, beggars sitting on street corners while Javert sings his heart out in Stars... What is their purpose in the scene? Do they relate to Javert somehow? Do they hear what he says, and if so, why don't they seem to care? Or the nuns that appear in Confrontation, calmly wrapping Fantine's body in a sheet while Jean Valjean and Javert yell at each other – why don't they do something to stop the fight, or at least act scared or annoyed? Why can't the main characters have these moments alone? In general, I think the production's biggest issue is the lack of focus. Some productions have a way of leading the audience's gaze to the right spot and the right character in every scene. Here, so much is happening you don't know where to watch. In the souvenir programme, director Sørensen boasts that they have almost twice as many people onstage as an average production of Les Mis. He thinks it makes the whole thing more impressive. I disagree. Maybe, if the director had some good use for the extra ensemble, it really would be striking – but as is, it seems they're there just for grandness' sake. Not impressed. Granted, Folketeateret has a huge stage, both wide and deep, and I'm sure it has been a big challenge coming up with ways to fill the space. I have a feeling, though, that both sets (design by Petr Hlousek) and lighting (design by Reidar Andreas Richardsen) could have been used a bit more effectively to divide the big space into smaller compartments. The lighting design is actually sort of disappointing – with lots of hard edges and cold tones, I think it would seem more at home in some small-scale onstage adaptation of a Nordic noir novel. In his essay in the souvenir programme, director Sørensen says this production is all about realism. The thing is, I don't think Les Misérables is meant to be a realistic musical. To function as it should, I believe it requires a dash of melodrama, a touch of something grand and noble. In most productions, the way the characters' deaths are handled underlines the romantic undertone of the story. 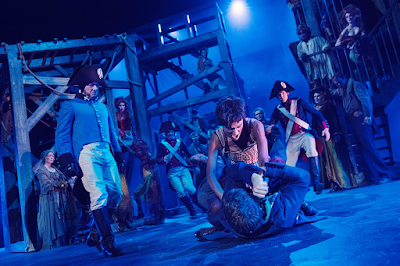 If the deaths are all majestic, like the iconic tableau of Enjolras lying on the barricade, it does not feel out of place when the characters rise from the dead in the musical's finale. But here, the whole epilogue is like from some other musical. After they unceremoniously roll Fantine into a sheet and dump Éponine in a sewer, it does not seem right they come back to welcome Valjean into the afterlife. This production is strongly reminiscent of the 2012 movie adaptation of Les Mis, both visually (the costume design by Oddfrid Ropstad especially) and direction-wise. I get the feeling Sørensen has watched the Tom Hooper film one time too many and tried bringing its brand of gritty realism onstage, without stopping to think whether the style Hooper chose actually benefits the source material or not. Don't get me wrong, the direction is not all bad. There are many good little details – like Cosette recognising the Thénardiers in the wedding – but sadly, it's the weird moments that stick out. I'm not going to make a full list, but here are three details that I found the silliest: Javert, who otherwise seems like a calm dude, straight up punches Jean Valjean not once but twice; Valjean reveals his true identity in the court by taking off his wig (must be hard being the only bald guy in all of France); in Paris, Marius follows Cosette around from one poor person to next and they end up wiping the same beggar's face. As far as I can tell, the cast is all good, it's just that oftentimes the directional decisions distracted me from focusing on the performances themselves. I wish I could tell you what André Søfteland's Valjean is like, but I really had a hard time concentrating on him with so many other weird things happening and so many other people onstage. I did like Javert, though. I got the vibe I would absolutely adore Hans Marius Hoff Mittet's portrayal of the character in some other production, or even here, if I got to see him again from the front row instead of the balcony. He had a nice undertone of calmness and introspection going on. That's something you don't see all that often these days, with so many overstatedly angry Javerts out there. Both Hoff Mittet's voice and his performance reminded me of the Finnish Sören Lillkung, a longtime favourite Javert of mine. So thumbs up! Besides Javert, there is an another, more surprising upside to this. 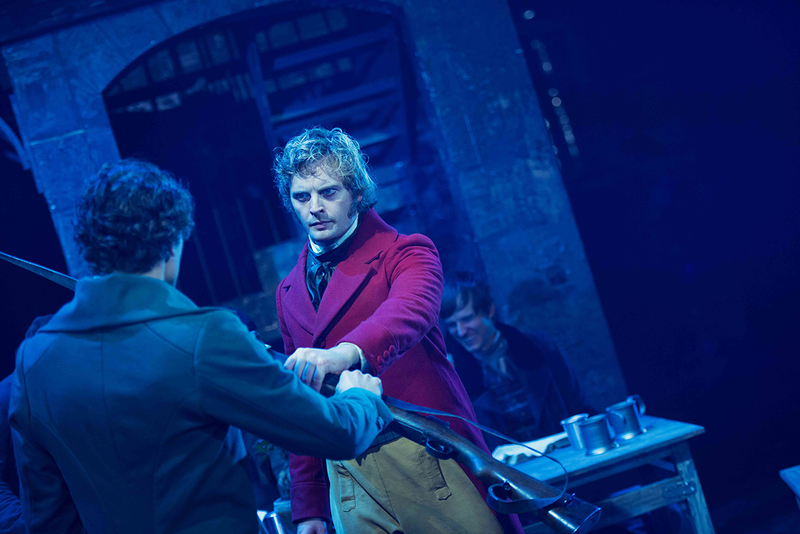 To me, the most interesting thing in the whole show was the relationship in between the revolutionary Enjolras (played by Andreas Hoff) and the revolution's token sceptic Grantaire (Lasse Vermeli). In Hugo's original novel, many interpret Grantaire being unrequitedly in love with Enjolras, but here, the feelings are mutual. It's a thing in the Les Mis fandom, wanting to see these two characters together. This production got the memo. In the first act, Enjolras uses a lot of time convincing Grantaire the revolution's worth joining – most notably singing his whole verse in One Day More to Grantaire and Grantaire alone. At the same time, he teaches him how to shoot a gun, in the romantic comedy trope sort of way. You know, standing unnecessarily close to him, gently taking his hands to correct the way he holds the weapon. This goes on throughout the song. In the second act, they fight, they make up, they hold hands. When the barricade is about to fall, Enjolras bids Grantaire the most heartbreaking farewell in musical history by taking his hands and kissing them. Ah, my heart, this is worse than Titanic! Then, in the finale, Grantaire rushes to join Enjolras, and the two of them once again stand side by side in the afterlife. Good for them, and good for Grantaire especially. It must be hard being in love with someone who clearly loves you back, but loves the revolution even more. But all that said... Well, being a fan, I enjoyed seeing Enjolras and Grantaire's romance flourish onstage, it certainly made the production more fun to watch. At the same time, though, I think it stripped Enjolras of the role he's supposed to play. He's not onstage a lot, he only has a couple of scenes to convince the people of Paris (and also the audience) that the revolution is worth dying for. How can he do that when they make him spend most of his time telling his sceptic boyfriend it'll be nice dying together? They're a cute couple, but seriously, that's not what Enjolras is supposed to be doing. In short, I suppose if you've never seen Les Mis before, this production works okay. The show looks good and sounds good, the iconic songs are of course all there, you get a grasp of what the story's about. If you're a big fan of Les Misérables the movie, you'll probably like this too, it's so obviously inspired by Tom Hooper's vision. The whole thing is very big and grandiose, if that's your thing. But if you're like me and know the original stage musical by heart, I'm certain you'll be struck by the weird pacing and the absurdity of the details. I'm glad I got to see this production once, but at the same time, I'm glad I don't have to see it ever again. I am completely here for introspective Javert. I do dislike the angry, hot-headed Javert interpretations that I see. Reading this reminded me of one production of Les Mis I saw, where the odd direction really overshadowed the characters and made it feel... not like Les Mis at all.